The right solution for your business doesn’t just happen. You need an expert. Estimates suggest that every hour spent on developing thorough system requirements will save more than 10 hours during development and implementation! The most technically-advanced equipment can’t fully improve your operation if it’s not integrated properly to existing enterprise systems. Even highly-skilled IT departments rely on outside systems consultants when it comes to complex mobile computing, wireless LAN/WAN, RFID and enterprise printing solutions. Since 1993, Inovity has improved the performance, productivity and efficiency of numerous companies by designing, implementing and improving database management systems, line-of-business applications and workflow processes. Our experience allows us better management of project costs and implementation timeframes, which lets our clients achieve realistic, timely and measurable results. Inovity supplements your IT department with resources to manage your project, either along side your staff or on our own. Either way, we’ll integrate seamlessly into your business applications, help you move the project forward, and step back once our job is done. Our PS group acts as an extension of your IT team. Our system engineers and architects are continuously engaged in a variety of client projects, and are therefore exposed to a broad spectrum of technical environments and situations daily. This hands-on experience is vital as we develop a system for your business. We follow a project delivery method based on industry best-practices and past implementation experience. During our analysis and assessment phase of system consultation, we determine which technologies and solutions will make your project a success. We make hardware and software recommendations to leverage your existing systems, meet your budget and fulfill the business and operational needs of your organization. While we have strong partnerships with numerous industry-leading manufacturers, we are an independent systems integrator and make the best recommendations based on your needs. Your and your project’s best interests are our guiding principles when making any technology recommendations. As a complete systems integrator, we are committed to the complete success of your Auto ID project. With experience across multiple industries and with companies of all sizes, our team of industry experts provides unparalleled solutions, service and support for virtually any data automation project. We understand you have many choices and decisions when implementing a complex system integration project, and we would be privileged to serve as your trusted innovation partner. Inovity is a technology-focused solution provider that can help you improve the efficiency of your business. We are here to answer your calls, understand your business needs and develop a long-term partnership. Let's talk! Or, fill out this brief form to find out more about how Inovity can improve your operation. Get cloud-based management for mobile devices and Zebra printers, whether in the same building or across the country. This is a true game-changer for IT departments with limited time and staff. 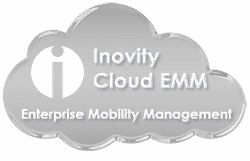 Start a free 30 day trial of Inovity Cloud EMM today. Get industry-related news and information on upcoming Inovity technology events delivered straight to your inbox.